A new actuating material discovered by a Hong Kong-based research team could revolutionize the way robots are built, including giving them artificial muscles. If scalable, this new material could negate the need for nuts, bolts, and other mechanical parts in robot assembly completely. In a breakthrough development for robotics, scientists design a new material with unique actuating powers that can be induced using light. Many everyday devices and objects use actuators, but for robots, they’re of much significance. Robots rely on different kinds of actuators and motors to navigate their environment. They need sensors to explore their surroundings, but without actuating mechanisms, robots can’t even move to perform their tasks. What if robots could combine sensing and actuating power into one, creating an artificial muscle that bypasses the need for bulky motors and actuators altogether? Theoretically, this was for long known to be possible based on the concept of actuating materials. Now, however, scientists from Hong Kong have made a big step toward making it a reality. Material scientists and engineers have been investigating new classes of actuating materials for decades. Ideally, a composite material for such use would exhibit fast reversible actuating properties (augmenting and reducing its volume) under the action of different stimuli. 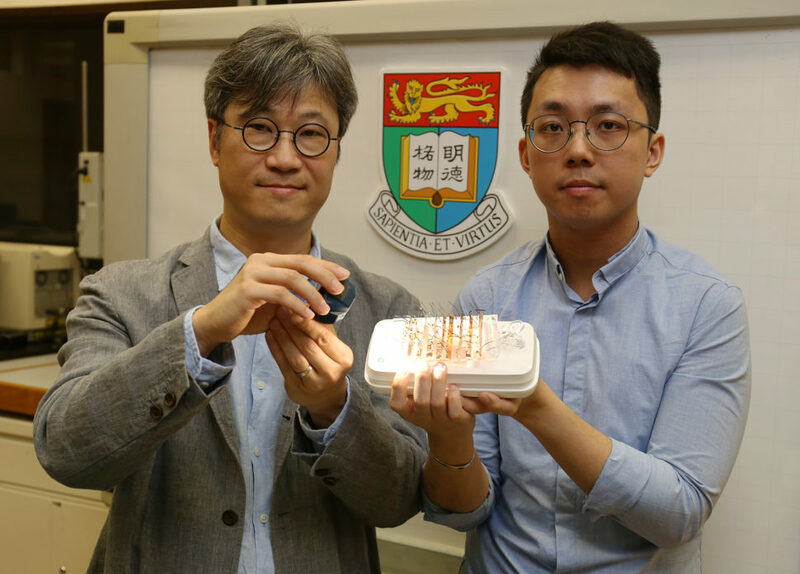 A team of mechanical engineers at the University of Hong Kong (HKU) released a report about their invention of a material whose instantaneous actuating power can be triggered using visible light or other stimuli like electricity. The NHO material is easy to make, requiring a simple three-hour fabrication process that can be scaled up to meet industrial needs. Because it’s based on cheap and widely available nickel, NHO costs as low as 4 Hong Kong Dollars per cm2 (that’s 51 cents in U.S. currency). Nothing quite illustrates the significance of this breakthrough like the fact that the development of actuating materials is number 1 on Science Robotics journal’s list of the 10 grand challenges currently facing robotics. What’s more, this development will go a long way into making the second challenge, Bioinspired and Bio-Hybrid Robots, more amenable, and help in tackling other challenges on the list as well, like number 5, Navigation and Exploration. This new actuating material from the HKU team means that wireless, motorless, soft and autonomous robots are now more feasible than ever. With its actuation being electricity and light-induced, nickel hydroxide-oxyhydroxide will fit right into the current robotics technology ecosystem. It could also provide newer, more robust artificial muscles for prosthetics and bionic prostheses that would be stronger and more responsive than anything on the market today. Do you think this new material could lead to a breakthrough in artificial muscles for prosthetics?